Christoffer Eriksson at Vard Aqua with the AquaVision product, developed in collaboration with CtrlAQUA. Photo: Terje Aamodt © Nofima. “We all know that research yields both positive and negative results. But it is the challenging measurement conditions and poor visibility in recirculation aquaculture systems that have really driven our product forward. 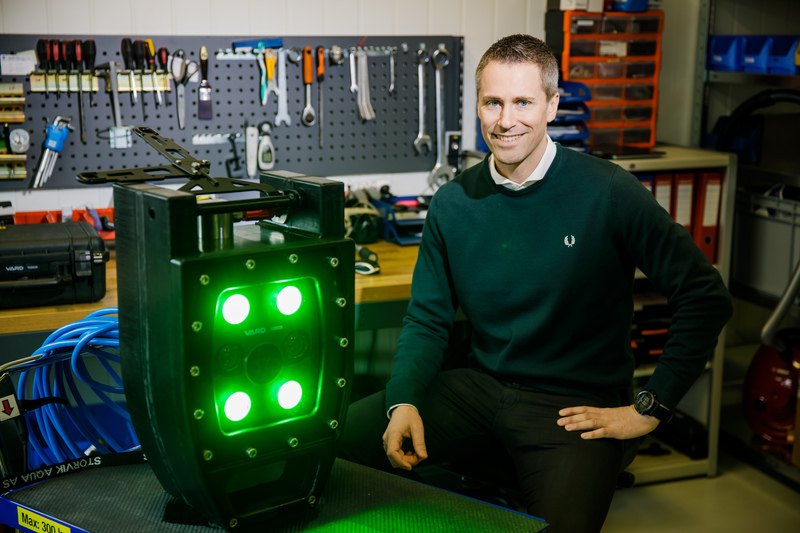 We have updated several components on the basis of tests we have performed at CtrlAQUA, which revealed issues we might not have detected otherwise,” says Christoffer Eriksen, head of technical developments at the technology supplier Vard Aqua Sunndal (formerly Storvik Aqua). The product he is talking about is AkvaVision, which is central to CtrlAQUA’s BIOMASS project. AkvaVision is a biomass measurement camera that the company first developed for use in open pens, and that has since been refined for use in closed containment systems. AkvaVision is a priority product for the company. The AkvaVision biomass estimator monitors the growth and average weight of fish, and fish farmers need accurate estimates to be able to operate efficiently. “A camera with a sensor takes a picture of the fish as it swims by. The size of the fish is calculated using algorithms. This happens continuously, and the device is wirelessly connected to a cloud solution where results are displayed in real time, enabling the operator to monitor the fish from the office. The biomass estimator is soon ready for commercial launch. Before Christmas, Vard Aqua validated the biomass estimator for fish up to 250 grams in closed containment facilities. They measured 3,500 fish in Nekton Havbruk’s semi-closed concrete pen, with estimated daily growth of roughly 2 grams. The growth estimates matched actual growth with a very high degree of accuracy. Vard Aqua launched this biomass estimator on the market in 2017. Now they are in the process of validating the biomass estimator for fish ranging from a few grams up to one kilo in closed containment systems, and the plan is to get this version out on to the market in 2018. Vard Aqua has a long history of innovation within aquaculture technology and has always collaborated with its customers on research. Through the partnership with CtrlAQUA, however, they have access to experts in a range of relevant disciplines and get to test the product they are developing for the industry in a variety of demanding conditions. “Without a research partnership like CtrlAQUA, we would not have managed to develop this innovative device and test it. This partnership provides us with unparalleled opportunities to perform tests. We do not have access to commercial-size closed containment aquaculture facilities ourselves, and with CtrlAQUA we can conduct and document tests in a more controlled fashion than if we run trials in a commercial player’s facilities. Why is the biomass estimator so important in closed containment aquaculture? “Having full overview of the biomass is essential to be able to make informed decisions and together with other sensors can provide better control of fish welfare and health, which will in turn result in increased profitability for the fish farmer. I believe that in order to achieve increased production, we need better control and overview in the facilities than we have today, and here new technology will play a key role,” says Eriksson. Read also interview with Siri Vike, Pharmaq Analytiq.